Reaching level 10 is TRULY mathematical! 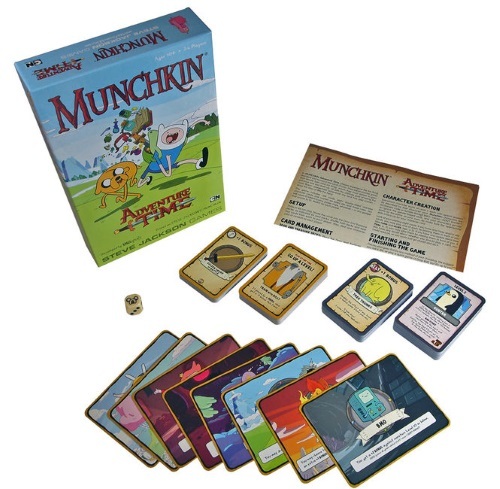 Munchkin, the Munchkin characters, and the pyramid logo are trademarks or registered trademarks of Steve Jackson Games Incorporated, used under license by USAopoly, Inc. All rights reserved. Adventure Time is ™ and © Cartoon Network (S13). Munchkin is a dungeon clearing card game where over the years has had different themes applied to it such as Pathfinder, zombies and Cthulhu. The most recent version is an awesome combination of Munchkin and Adventure Time, the cartoon series that follows the adventures of Jake the Dog and Finn the Human throughout the Land of Ooo. What do I like about this game? The transition of the Adventure Time theme to Munchkin seems to be a perfect match. If you’ve ever seen the show you know that everything they do looks and feels like an adventure game. Now, we can finally play along through those adventures. Also, the little references on the cards are great. For example, the “Spot the Snail” Level Up card gives you 10 seconds to find a snail on any of the cards in play in order to gain a level. Also, every character card has the gender swap on the opposite side which can come into play if certain cards are played. It’s a nice nod to the show’s popular Ice King Fan Fiction episodes. What don’t I like about this game? Even though you’re supposed to solve disputes with “loud arguments” some people may not like that too much. Also, when we were playing it sometimes the classes were contradicting to the character you were playing as. For example, Princess Bubblegum wasn’t considered royalty unless she had the Royalty class card. For newcomers, this probably isn’t an issue since you’re not as concerned about who your character is in the show, but for people like us who know which characters are actually musicians, heroes, wizards, and royalty, you might accidentally give yourself a bonus when you shouldn’t. But, this may just be me thinking too much about my character. I’m sure most people won’t have this problem. I really enjoy playing ‘Munchkin Adventure Time’ with my friends and family. I’m a big fan of the show but, at the time, I’d never played a Munchkin game. In fact, I’d never played anything at all similar. After the first playthrough, I was hooked. Naturally, I excelled and I’ve won every time so far. My favourite part of the game is the ‘kick down the door’ because you never know what you’ll get. Whether it’s a curse that makes you lose your headgear, a level 1 monster or even a trusty ally, the pile always provides a plot twist. Add a Review for "Munchkin Adventure Time"